ConvergenceCoaching, LLC > Where is Your Firm with AnyWHERE Work Programs? Earlier this year, we launched our third annual Anytime, Anywhere Work™ Survey to collect information about the adoption of flexible work initiatives within public accounting firms. So far in our blog series, we’ve shared an overview of our survey results, the benefits and challenges firms experience with their flex programs, and how firms are enhancing their flexibility around WHEN their employees work. In this blog, we’ll focus on the types of programs firms are implementing so their team members can choose WHERE they work. When we talk about Anytime, Anywhere Work™, we suggest you consider two program areas: WHEN people are working distinct from WHERE they can work because WHEN and WHERE come with specific considerations that need to be understood and managed. There are firms who have developed highly flexible programs related to WHEN (for instance, those offering Fridays off in summer) who adamantly require their team members be in the office when they are working. As a result, we find it helps to break time and place apart and recognize that there are different offerings under each category. In this year’s survey, an overwhelming 94% of firms indicated that they allow their team members to flex the place WHERE they work through programs like work from home or working from a remote location. 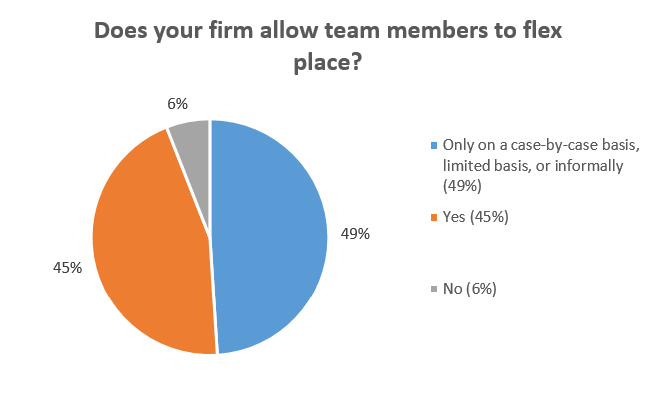 Nearly half of the firms surveyed (45%) offer formal programs, while the other half (49%) only offer the opportunity to flex place on a case-by-case or informal basis. When asked whether they offer work-from-home programs, 44% of respondents allow employees to work from home on an as-needed or occasional basis. We call this as-needed flex “Day-to-Day Anywhere Work,” and when you offer it, you’re indicating that you’ll allow employees to flex their place of work as needed to manage events like doctor’s appointments, trips home to let in the plumber or staying home with a sick kid or parent. Taking advantage of this benefit may still mean that you’ll need to notify your supervisor, or ensure coverage for yourself if that’s appropriate, but the organization recognizes that life happens and you’ll occasionally need flexibility on where you work to appropriately manage both life and business obligations. 40% of survey participants indicated they have employees who regularly participate in a work-from-home program. They may work one or two days from home, or every day remotely like we do at ConvergenceCoaching. Either way, work-from-home in these firms is a regular, clearly understood arrangement that firms expect to be a win-win-win for the employee, firm and clients, too. For some team members, it’s a way to alleviate the effects of a long commute, and for others it offers “bonus time with family” seeing kids off to the bus in the morning or taking 15 minutes to say hi when they arrive in the afternoon and then heading back to the home office. These work-from-home employees are still expected to produce the agreed-upon results, train staff members, and participate fully in the smooth functioning of the firm. In past surveys, we’ve explored whether firms are employing remote employees, or team members not working in the firm’s local geography. What’s different this year is that we delved more deeply into the origin of the relationship with the employee and whether it was due to an existing employee’s need to move elsewhere, or if it resulted by recruiting a new employee in a remote geography. We weren’t surprised to see that 42% of firms employ a team member who moved out of the firm’s geographical area and continued working for the firm. This is an excellent way to begin your firm’s journey to remote work programs, since you’ll be kicking it off with a team member who is already a trusted, trained member of your team. We would suggest that you never let another team member leave for this reason. You might even review the list of alumni you lost because they left your geography, and see if they’d be interested in working for you remotely today. Use these opportunities to retain valued employees and start building out the capacity of your team to manage in a virtual environment. 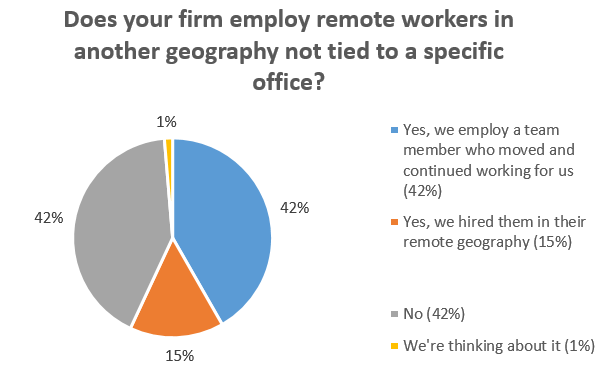 23 leading edge firms (or 15%) chose our new survey response, “yes, we hired [the remote employee] in their remote geography” which we think is great! These firms have discovered a new recruiting pool outside of their normal recruiting marketplace, an exciting benefit of virtual work programs and a real advantage in today’s tight labor market. This year we asked questions on virtual auditing – audit work performed away from the client site – like we have in previous surveys. We plan to focus a blog on the topic and look forward to sharing those observations with you later in this series. One of the main reasons your team members are asking for the ability to work remotely is because they can – because technology and paperless solutions have evolved to the point where we can work just as effectively from outside the office as we can while sitting at desks inside the firm. You may discover (or already know) that your technology isn’t at the level it needs to be, and a lack of the right technology can hamper your team’s ability to work effectively from a remote location. Stay tuned for our future blog in this series that will focus exclusively on technology and some of the specific solutions firms are utilizing to support Anytime, Anywhere Work programs. Educate your firm leaders on the impact of sludge – it will drive away your best people who also desire flexibility of place. And when you hear others being unsupportive of your flexible team members, use these new school phrases and ideas to help shift their thinking on how to support flexibility in your firm! Team members are looking for more control over WHERE they perform their work, to allow them to better integrate their personal obligations and interests with their work responsibilities. We hope the ideas included here will help you progress and grow your PLACE based flexible work programs!